From dozens of brands, MaxiCoffee has selected the most suitable coffees for professional use. To bring the costs down and meet professional consumption levels, we are selling them as a bulk pack. Whether you have a Coffee shop or an Espresso Bar or just want to buy as a group, these coffees are for you! This Coffee Shop Blend is a blend especially made for Coffee Shops! 10kg (20x500g). Free delivery. 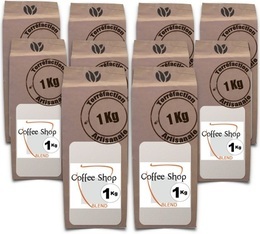 Hosteleria coffee by Vendin is a Robusta, creamy, intense coffee bean. Ideal for those who like their coffee strong and bitter! 12kg. These Lucaffé Espresso Bar coffee beans (12kg in a heat sealed pouch) represents the basis of the Italian espresso par excellence. One Love by Marley Coffee was born in the birthplace of coffee: Ethiopia! It reveals notes of blueberry, cocoa and spices, it is a perfectly balanced coffee. Set of 24 packet. Free delivery. Lively Up! Coffee beans by Marley Coffee will satisfy all espresso lovers: Both rich and balanced, it leaves a long-lasting taste in the mouth and reveals notes of cocoa, candied fruits and caramel. Set of 24 packet. Free delivery. Pack of 600 Pellini Capsules compatible with Nespresso®*. Containing 5 Pellini coffees (120 capsules each of Pellini Top, Pellini Supremo, Pellini Armonioso, Pellini Magnifico, Pellini Top Decaffeinato). These capsules are packaged in a stylish box: bulk pack of 60 boxes of 10 capsules. Free delivery. 480 Pellini Nespresso® compatible* mellow coffee capsules. These Pellini Top capsules by Pellini develop intense chocolate and floral aromas. These capsules are packaged in a stylish box: bulk pack of 48 boxes of 10 capsules. Free delivery. 480 decaffeinated Pellini capsules compatible with Nespresso®* with a soft intensity. These Pellini Top Decaffeinato capsules use a natural decaffeination process which keeps the maximum flavour possible. These capsules are packaged in a stylish box: bulk pack of 48 boxes of 10 capsules. Free delivery. 480 Pellini capsules with a balanced intensity, compatible with Nespresso®* These Supremo capsules from Pellini develop a floral and fruity flavour with citrus notes. These capsules are packaged in a stylish box: bulk pack of 48 boxes of 10 capsules. Free delivery. 480 Pellini capsules with a strong intensity, compatible with Nespresso®* These Armonioso capsules from Pellini develops a flavour of toast and dried fruits. These capsules are packaged in a stylish box: bulk pack of 48 boxes of 10 capsules. Free delivery. 480 Pellini capsules with a strong intensity, compatible with Nespresso®* These Magnifico capsules from Pellini develop an intense flavour of chocolate, dotted with subtle notes of honey. These capsules are packaged in a stylish box: bulk pack of 48 boxes of 10 capsules. Free delivery. The Espresso Bar Vivace N°82 coffee has a distinct and strong flavour. Made from 80% Arabica and 20% Robusta coffee beans, perfect for trying a delicious espresso without a hint of acidity. Set of 6kg. Free delivery.